During the past few weeks, the leading cheerleader for Iran has been the National Iranian American Council. A curious institution in that its mission statement discusses the need to bridge cultural understanding and empowerment of Iranians living in America, but instead it fills its websites, blogs, Twitter feeds, YouTube channels and other social media feeds with a relentless stream of vocal support for the Iranian regime; sometimes bordering on the hysterical. It is an odd position to take since while the NIAC is ostensibly here to support IranianAmericans, it spends almost its entire bandwidth on issues related to Iran and more specifically the policies of the Iranian government. As documented throughout this website, the NIAC has a nefarious history of being supported by the Iranian regime itself and was created to help bolster Iran’s positions within the American media, Congress and various non-governmental organizations. Most of NIAC’s internal workings were revealed through a defamation lawsuit that NIAC eventually lost and in the process was forced to reveal its connections to the Iranian regime. But a more scientific and entirely more interesting social media look at NIAC reveals a similar commitment to Iran without any attention to the pressing issues the vast majority of Americans and Congressional Representatives and Senators are interested in. By using a word cloud generator through NIAC’s own RSS feeds, we gain some insights through NIAC’s own words what its priorities are. At a time when ISIS is exercising brutal murders on video and Boko Haram is rampaging across Nigeria and Yemen is collapsing, while Iraq and Syria are gripped tighter by Iran’s Revolutionary Guard Corps, NIAC’s word cloud is amazingly devoid of any of these issues. In fact, even a casual perusal of the Twitter feeds of NIAC’s leaders such as TritaParsi, Tyler Cullis, Reza Marashi, Jamal Abdi and Ryan Costello for example reveals virtually no mention of human rights, terrorism, radicalization, extremists, or anything remotely connected to what is happening in the real world. In fact, NIAC and its employees and supporters seem to be gripped with the same linguistic disease afflicting members of the Obama Administration; the inability to utter words like those related to the despicable activities being perpetrated by Iran and its terrorist allies. 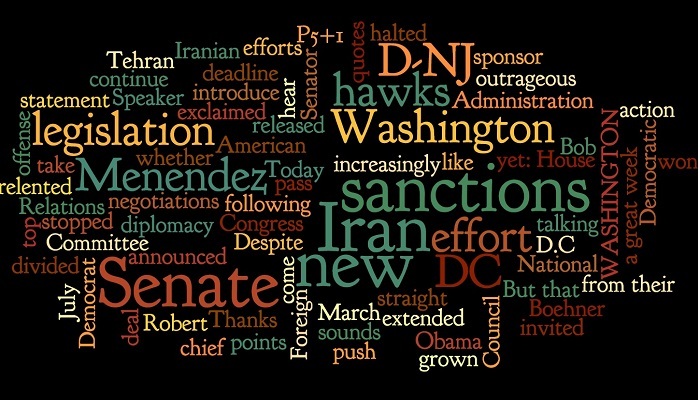 If we look at a word cloud for NIAC, we see ample use of words such as “Menendez,” “Washington,” “Sanctions,” and “Senate” but nothing about “human rights,” “terror,” “abuse” or even “women.” An odd scenario for an organization supposedly dedicated to the plight of Iranian Americans, and yet American Iranians remained imprisoned in Iran and await an uncertain fate. None of their names get mentioned by NIAC even though they are the ones the NIAC is supposedly championing their causes. This all leads us to the basic truth about NIAC: It is nothing more than a mouthpiece for Iranian government policy and should be treated within the same context as official Iranian news organizations. There is no perspective within their pronouncements except those approved by the Iranian government. In a way, it is a tragic development since there is a strong need for a passionate and loud voice on behalf of Iranian Americans here at home who pine for a return of their homeland to a pluralistic democracy, free from religious edicts and censorship, where women and people of differing faiths are free to pursue bright and promising futures. NIAC is indeed far away from that.